Therapy dogs, which offer affection and comfort, have a place in many people’s lives even outside the home. From schools and hospitals to nursing homes and even the workplace, therapy dogs are an important consideration for many areas of public life. Here are fours places that have shown benefits from having therapy dogs. Studies have shown that one of the best places for therapy dogs is in schools. Whether they’re in classrooms or high school or college campuses, therapy dogs offer several key benefits to both students and teachers. As a result of studies illustrating that therapy dogs can reduce stress and anxiety, many schools are adopting therapy dog programs as a way to help students focus and connect more in class. Therapy dogs have also been shown to help increase attendance at school and improve the outcomes of student learning and motivation. With studies showing how therapy dogs can reduce anxiety and stress in some individuals, it shouldn’t be surprising that hospitals can benefit from therapy dogs. The hope, joy, and optimism that therapy dogs provide can be a welcome sight in both waiting rooms and in hospital rooms. Because of these positive effects, therapy dogs have been adopted in a wide range of hospitals, from psychiatric hospitals to veterans hospitals. Of course, with issues such as allergies, hospitals have to adopt more stringent regulations about how to incorporate therapy dogs in their work. Simple guidelines, such as ensuring that the therapy dogs have been trained well and are at least a year old, can help hospitals incorporate therapy dogs into patient treatment safely and efficiently. One of the most common places that dogs are brought to these days are the workplace. Employees allowed to bring their four-legged friends to a “Bring Your Dog to Work” day don’t qualify as a therapy dog program. But legitimate, licensed therapy dogs have a place in the workplace. A therapy dog can lower employee stress levels. They can also improve the contributions of employees, by helping them to better react to stressful situations, which can, in turn, help to boost the morale of employees. Another location that can greatly benefit from the introduction of therapy dogs are nursing homes. Elderly patients receive the healing and helpful effects of an animal that provides increased self-esteem and morale, and even decreases some feelings of loneliness that a patient might have. At the same time, a visit from a therapy dog free from having to care for the animal every day is a great way to receive the benefits of companionship from an animal without the added responsibility in older age. Bringing therapy dogs into nursing homes, schools, hospitals, and the workplace are just a few of the places that a therapy dog can provide positive outcomes. 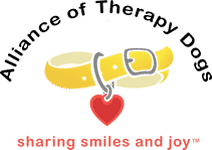 The Alliance of Therapy Dogs is a great resource for more information about the ways that therapy dogs can benefit society. 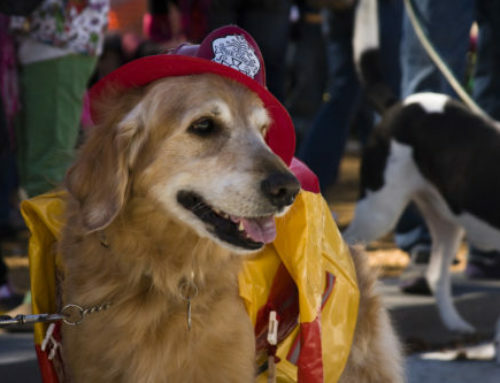 If you are interested in learning more about the work of therapy dogs or the ways that they can improve a variety of public spaces, check out our website or other blog articles and learn more.